WELLINGTON, New Zealand (AP) — With their very identity still in doubt, the defending champion Crusaders on Saturday will resume a Super Rugby season interrupted by unimaginable tragedy. The Crusaders will face the New South Wales Waratahs in Sydney, eight days after a white supremacist gunman killed 50 worshippers and wounded dozens more in attacks on two mosques in their hometown of Christchurch. A scheduled match the day after the shootings, a match between the Crusaders and Highlanders in Dunedin — a South Island derby considered one of the highlights of the Super Rugby season in New Zealand — was cancelled by agreement between the clubs as a mark of respect to the dead. The Crusaders have trained in a city where memorials to the dead and public displays of grief are now commonplace. Senior players admit to being deeply shaken by the events which a week ago overtook their usually peaceful home city. And the Crusaders have found themselves unwillingly drawn into a national debate around the forms of hatred and rhetoric that motivated the killer. The provenance and significance of the Crusaders name has been questioned and there have been calls for the nine-time Super Rugby champions to reject the name they have carried since they first took the field in 1996. Critics see the Crusaders name as a reference to the religious crusades of the 11th and 13th centuries, when military expeditions dispatched by Christians churches in Europe attempted to reclaim from Muslims significant religious sites in the Eastern Mediterranean. The Crusaders club management has rejected any connection to the crusades. In a statement after the Christchurch attacks, the franchise said "we acknowledge and understand the concerns that have been raised. For us, the Crusaders name is a reflection of the crusading spirit of this community and certainly not a religious statement." But the club has been hard-pressed to support that argument when critics point to the iconography which goes along with the name. The team's symbol is a knight wearing a cross and brandishing a sword. Comments on the Crusaders' Facebook page have been overwhelmingly in favor of retaining the name, with many condemning criticism as political correctness or a suppression of free speech. As criticism continued Crusaders coach Scott Robertson and All Blacks captains Kieran Read and Sam Whitelock gave an interview in which they said the time wasn't right for a discussion of the team name. "We want to go through a process, we want to let people grieve," Robertson said. "We want to make sure they've got time and we'll go to the people that can represent (Muslims) and get the information we need to make a great decision and do the right thing." Japan's Sunwolves appear to facing a crisis of existence if not identity. Super Rugby's governing body, SANZAAR, is expected to announce on Friday that the Tokyo-based franchise will be cut from the tournament from 2021, reducing it to 14 teams. The timing and import of the decision, reported to have been driven by South African interests who find the timing of matches in Japan inconvenient, could hardly be worse. 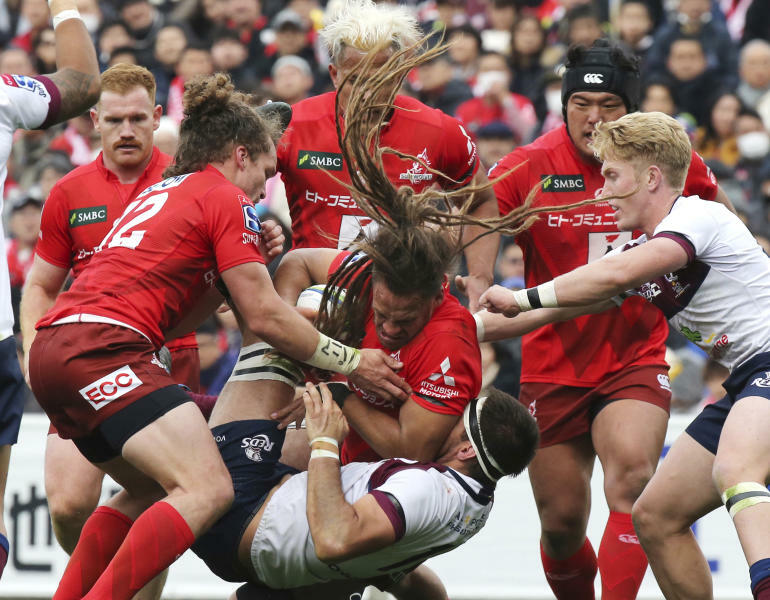 Japan is about to host the Rugby World Cup and the Sunwolves, Japan's first team in Super Rugby, is about to be bounced from the tournament. In other weekend matches, the Blues host the Highlanders in Auckland, the Hurricanes are at home to the Stormers in Wellington, the Bulls host the Chiefs in Pretoria, the Rebels travel to Durban to take on the Sharks and the Reds and Brumbies meet in Brisbane. 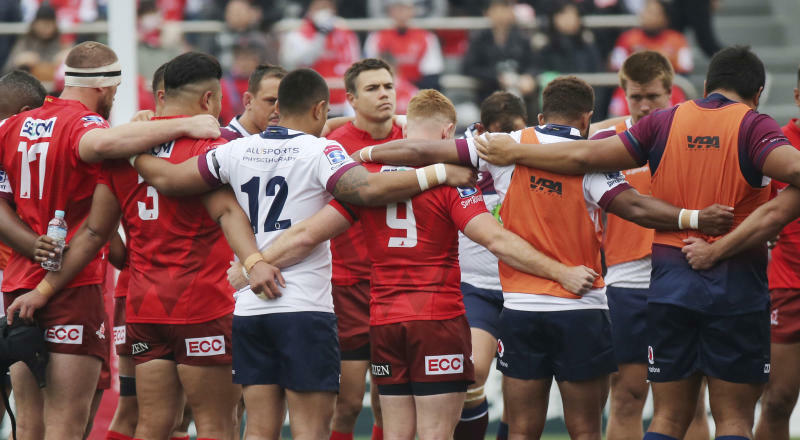 The Sunwolves, who play South Africa's Lions in Singapore this weekend, face legitimate questions about performance — they have won only seven of 51 matches since they joined Super Rugby three years ago. But their potential axing comes just as they seem to have turned a corner, achieving their first away win this season with a victory in New Zealand over the Hamilton-based Chiefs. As with the decision on the Crusaders' name change, timing may be everything.